We thought that there probably wouldn't be a new PopKid release in 2017, but we are happy to report that we were wrong. Please join us in welcoming Shoplifters to the PopKid records family. Shoplifters are from Serbia, but listening to their songs you might think they're actually from the UK...in 1994. Here at PopKid we first heard of Shoplifters through their incredible album Believe that came out on the mighty Waterslide Records. We were immediately taken with their stormy mix of Snuff and Big Drill Car punk rock. 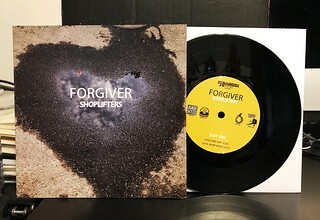 However, for this new 4 song 7", Shoplifters have cast their net even wider and caught a sound that that builds off of their prior work but incorporates new elements. This time out, you can feel the melodic side of the band come through even stronger. Often it brings to mind early, at their best, China Drum. At the same time, Shoplifters are tapping into a vein of even more ferocious energy than before with a whirlwind of forceful, Bob Mould-style guitar shredding. If you are looking for loud guitars, big hooks and melodic vocals you'd be hard pressed to find a band more up your alley than Shoplifters. The 7" is limited to 314 copies and is only available on Black Vinyl. This is available for sale right now from our webstore and also through our Bandcamp page. The 7" is $6 plus shipping and all records come with a download code. If you haven't picked them up yet, this could be a good time to grab the recent Custody 7" and Chestnut Road LP that we put out last year. Shipping is $4 no matter how much you buy, so why not save on those shipping costs and pick yourself up an early present. Remember the season of giving to yourself is all year long.